Automated spike sorting algorithm based on Laplacian eigenmaps and k-means clustering. Previous: Previous post: Deep layer prefrontal cortex unit discharge in a cue-controlled open-field environment in the freely-moving rat. Next: Next post: How should we talk about mental health? J Neural Eng. 2011 Feb;8(1):016006. doi: 10.1088/1741-2560/8/1/016006. Epub 2011 Jan 19. Chah E, Hok V, Della-Chiesa A, Miller JJ, O’Mara SM, Reilly RB. This study presents a new automatic spike sorting method based on feature extraction by Laplacian eigenmaps combined with k-means clustering. The performance of the proposed method was compared against previously reported algorithms such as principal component analysis (PCA) and amplitude-based feature extraction. Two types of classifier (namely k-means and classification expectation-maximization) were incorporated within the spike sorting algorithms, in order to find a suitable classifier for the feature sets. 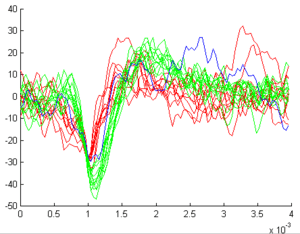 Simulated data sets and in-vivo tetrode multichannel recordings were employed to assess the performance of the spike sorting algorithms. The results show that the proposed algorithm yields significantly improved performance with mean sorting accuracy of 73% and sorting error of 10% compared to PCA which combined with k-means had a sorting accuracy of 58% and sorting error of 10%.A correction was made to this article on 22 February 2011. The spacing of the title was amended on the abstract page. No changes were made to the article PDF and the print version was unaffected.